I’m not entirely sure what Alex Carroccio is singing about in “Magdalene,” the driving, downcast opening track of Arctic Flower’s new album Weaver. 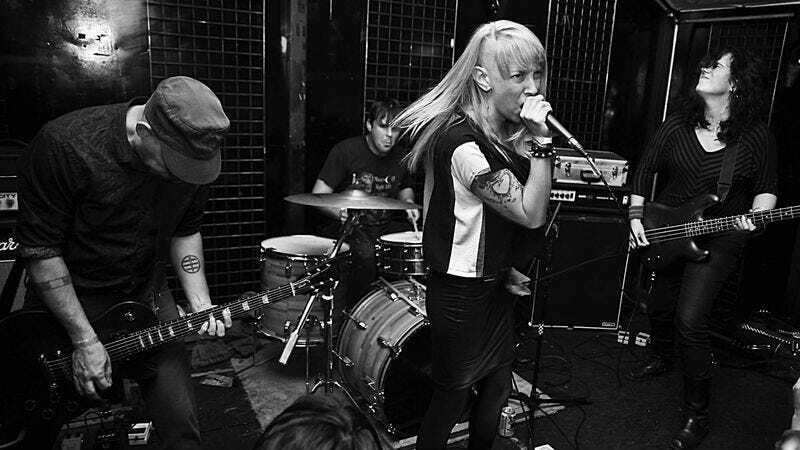 Bearing in mind the band’s political bent, I can only imagine it addresses organized religion and/or feminism—albeit in Carroccio’s poetic yet scathing mode of delivery, a smart, sharp, post-punk attack that the Portland group has been honing since its 2011 debut album, Reveries. I’ve been a big fan since then, and Arctic Flowers has only gotten better as its sound has deepened, darkened, and grown more eerily melodic. Weaver isn’t out on vinyl until May (courtesy of Deranged Records), but it’s been streaming on the group’s Bandcamp for a couple months now. It’s subtler and gutsier than Reveries; “Magdalene” is just one example of how Carroccio and company have revitalized the impassioned, early-’80s noise of the British underground, from anarcho-punk to death-rock. At the same time, the needling guitar in the verse of “Magdalene” is borrowed, either accidentally or reverentially, from an American punk classic: Naked Raygun’s 1985 song “I Don’t Know.” “Magdalene” hits so many musical sweet spots for me, Carroccio could be singing about the greatness of Margaret Thatcher and I’d probably love it. Maybe slightly less, but still.